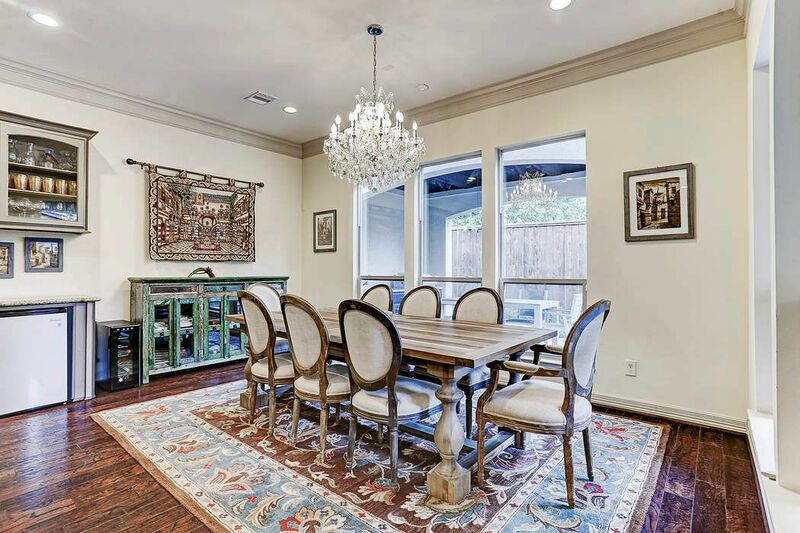 5322 Lampasas Street, Houston, TX 77056 | Martha Turner Sotheby's International Realty, Inc. 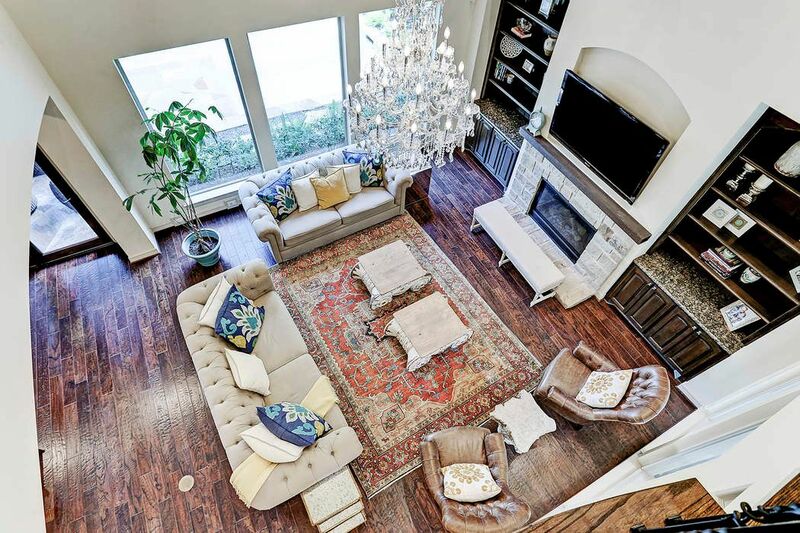 Stunning custom-designed home in the heart of the Galleria in St George Place. Built by David Powers Homes. Located on a cul-de-sac, easy access to major freeways. 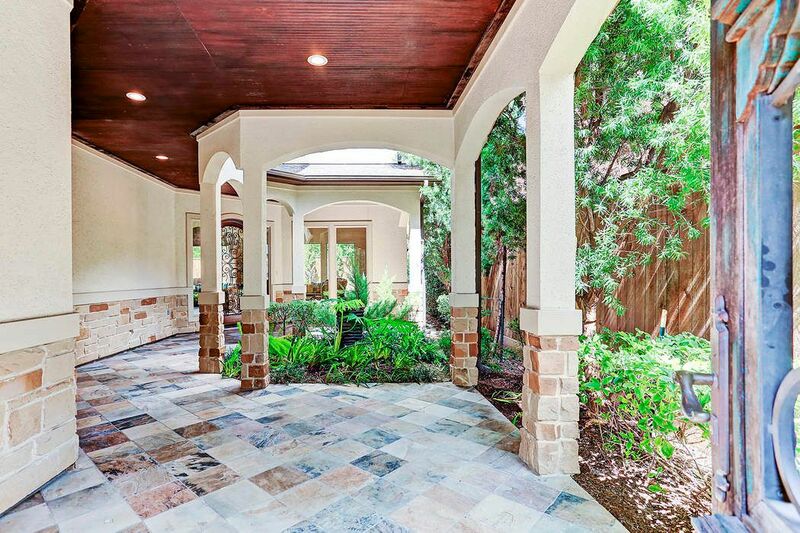 Stone walkway leads you to impressive custom-made double entry doors to courtyard. Stucco and stone exterior with tile roof. Double-wide driveway. 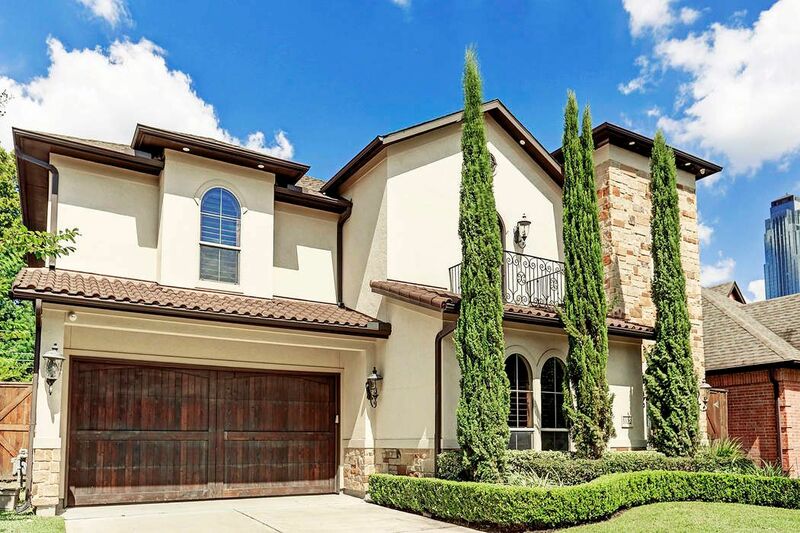 Automatic garage door opener, 2 front exterior security cameras, professionally landscaped w/ landscape lighting. Gutters & Sprinkler system installed. Upon entering, walk through the inviting & peaceful courtyard with fountain & gorgeous garden. 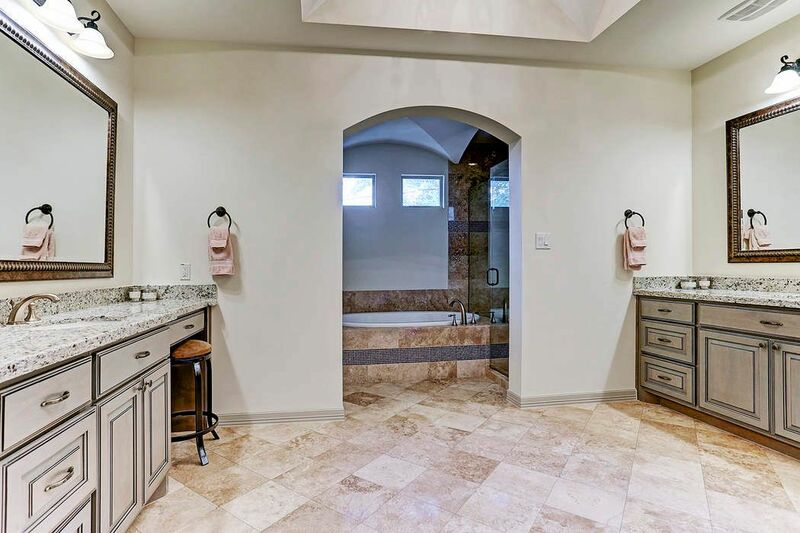 Covered entry with bead board ceiling, recessed can lighting, stone floor, arched openings. Controlled access w/ touch keypad, intercom w/ security camera. Make your way through courtyard to the homes front entrance. Beautiful decorative scrolling wrought iron and glass front mahogany door. 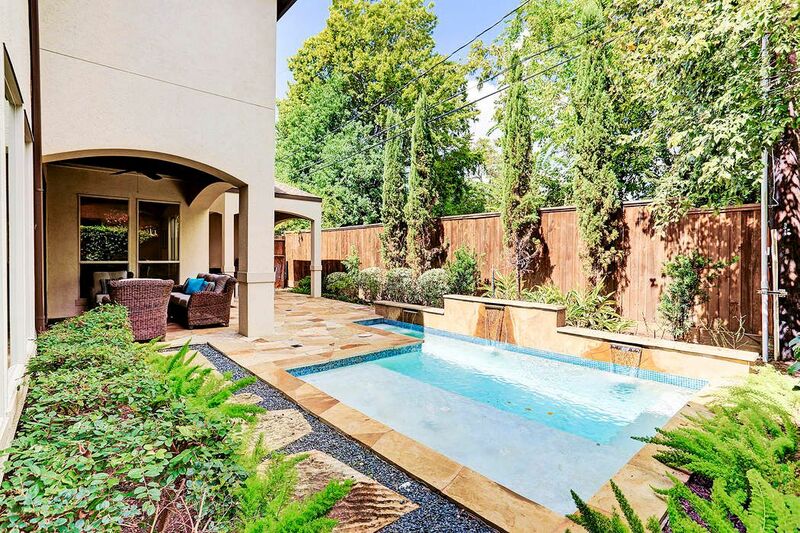 Gorgeous backyard features a sparkling dip pool w/ cascading waterfalls, large tanning step with bubblers. 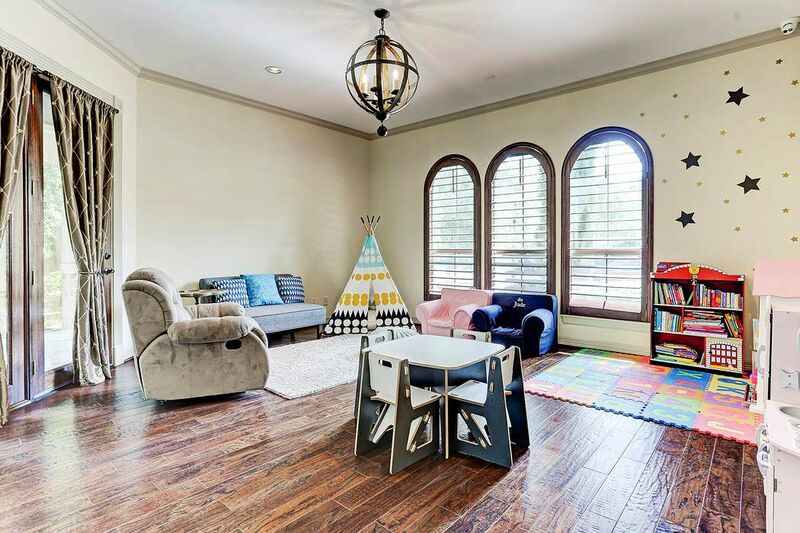 A fabulous space to entertain family and friends! Sprinkler system installed, fully fenced with high privacy fence. 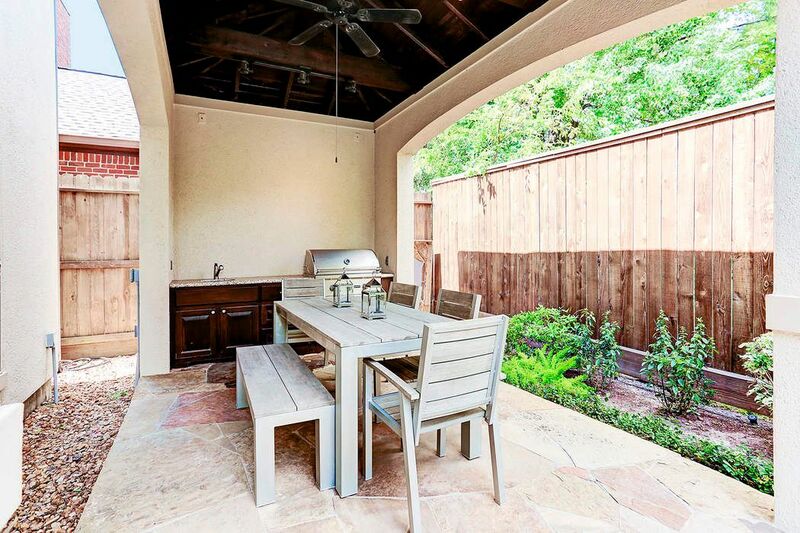 Covered summer kitchen with stainless steel outdoor grill, stainless steel sink, granite countertop, flagstone floor, track lighting, ceiling fan, electrical/cable outlets for tv. A great place to relax and enjoy the outdoors. 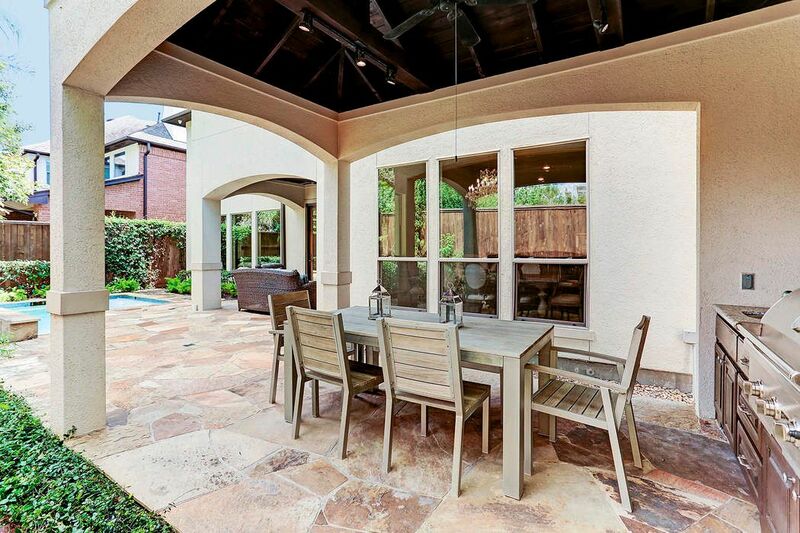 Covered patio area with flagstone floor, ceiling fan, bead board ceiling, recessed can lighting. Backyard has 1 exterior security camera, gutters, professionally landscaped. Recently installed automatic outdoor lights. Beautiful living room with impressive two story high ceiling. 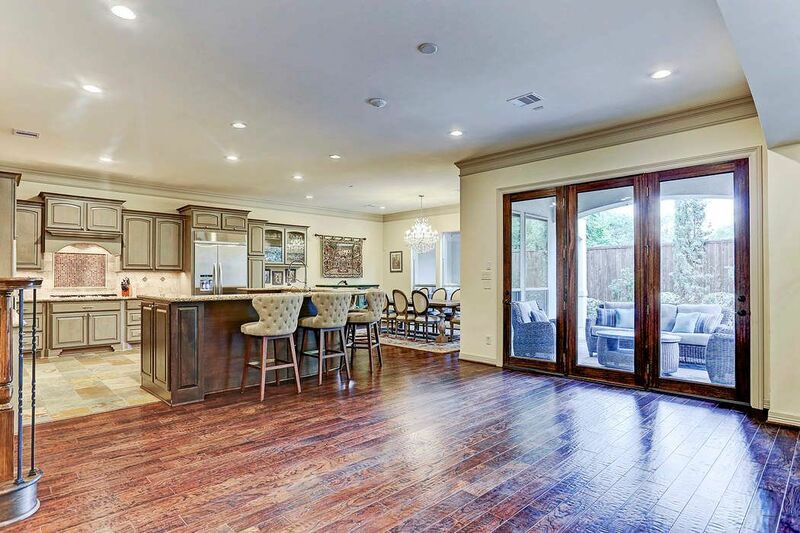 Open floor concept living w/ kitchen/dining/living rooms. The first floor is flooded with natural light with large landscape windows overlooking pool and backyard. Another view of the living room w/ custom-built book/display shelves (adjustable) w/ cabinets below, Baltic Brown granite countertop, TV niche. Beautiful gas fireplace w/ stone surround and wood beam mantle. Note: chandelier & wall speakers excluded. Sunroom, currently being used as the dining space. Various options to convert multi-use spaces as this could be used be used as a family den, breakfast space, or dining room area. Note: Chandelier excluded. 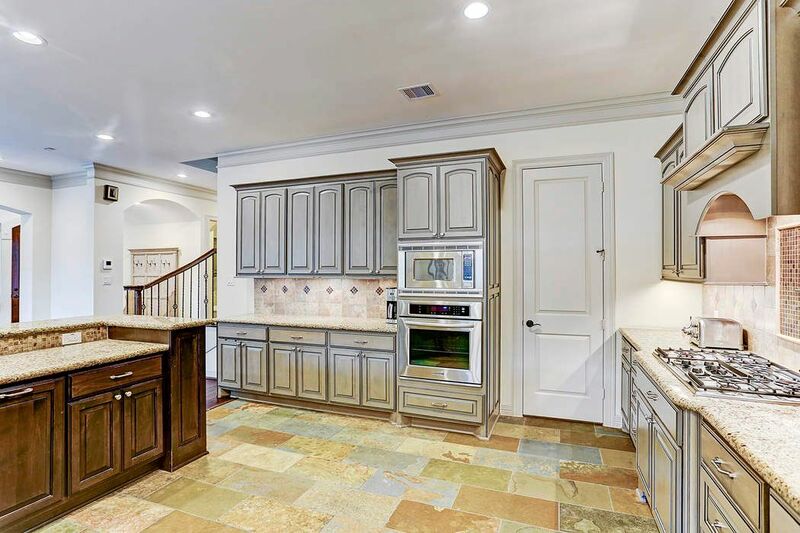 Chefs kitchen features KitchenAid stainless steel appliances: built-in French door fridge, dishwasher, built-in microwave, oven, 5 burner gas range w/ commercial vent . Granite countertop, decorative tile inlay on backsplash, under cabinet lighting. Door to the right leads to a huge walk-in pantry. Not shown are clear glass front display cabinets and a mini beverage refrigerator. 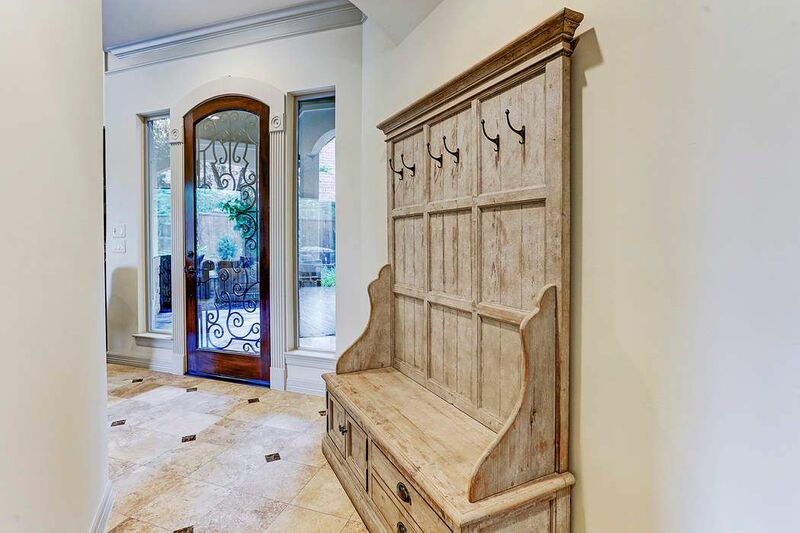 Abundant cabinet/storage space, recessed can lighting, double crown molding. 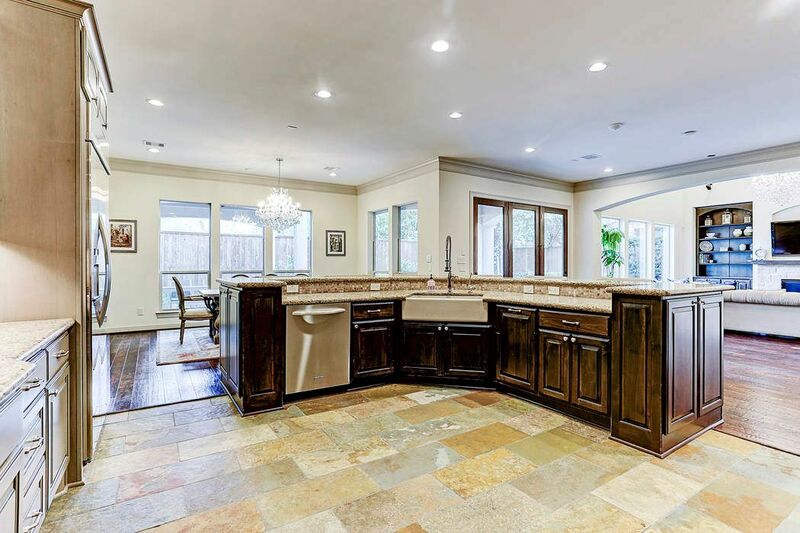 Kitchen features a practical large curved breakfast bar, farmhouse sink, slate floor, pull-out double trash can drawer. Recently installed pull down kitchen sink faucet. Tons of counterspace for cooking. View of what would be used as a dining area. Currently used as open space for kids to play. This home offers a variety of options for spaces. The dining area is pre-wired for a light fixture, opens to kitchen and living. Two doors lead to backyard. Another view showing what is intended for a dining space. 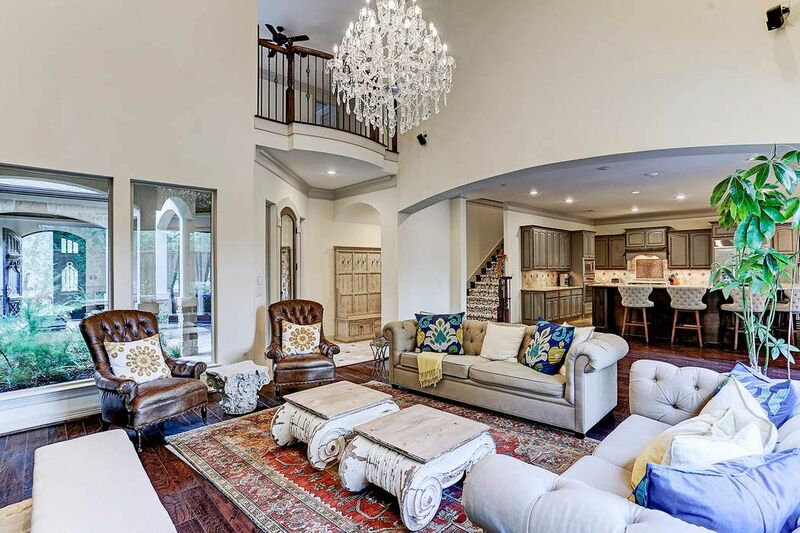 This home was designed for entertaining! Can lighting, double crown molding, pre-wired for surround sound, interior security camera installed in this space & in living room. 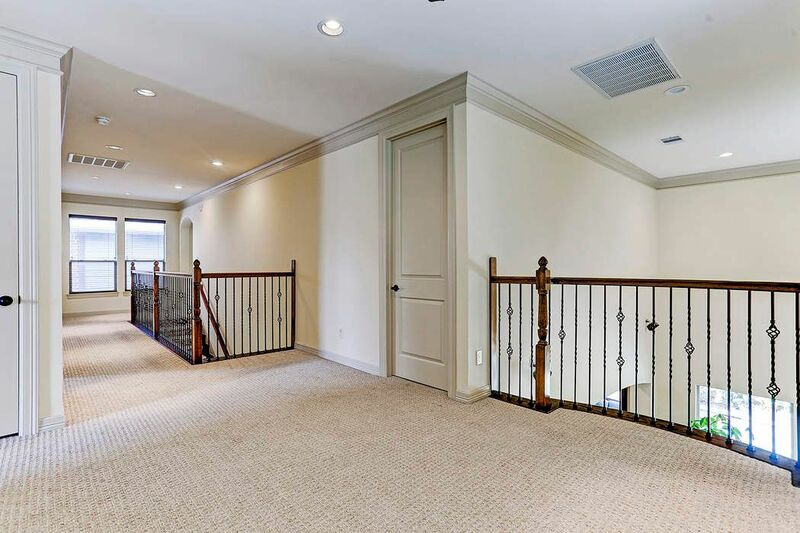 Upon entering, be greeted by a convenient and lovely foyer, ideal mud space. Barrel arch breezeway, tile floor with Emperado marble inlay, recessed can light. Full bath, located downstairs, with a beautiful decorative vessel sink, Dark Emperado marble countertop, Toto Washlet System installed. 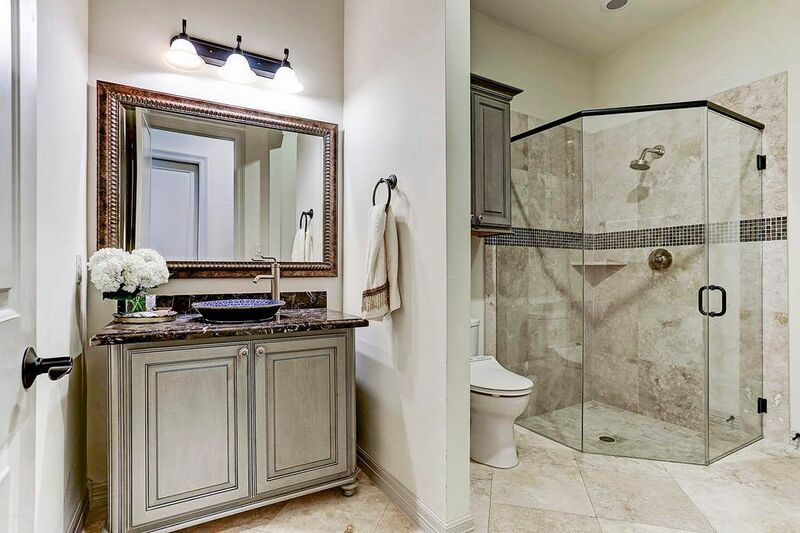 Shower w/ frameless door, Crema Bella marble tile wall w/ decorative tile inlay,Crema Bella marble tile floor. 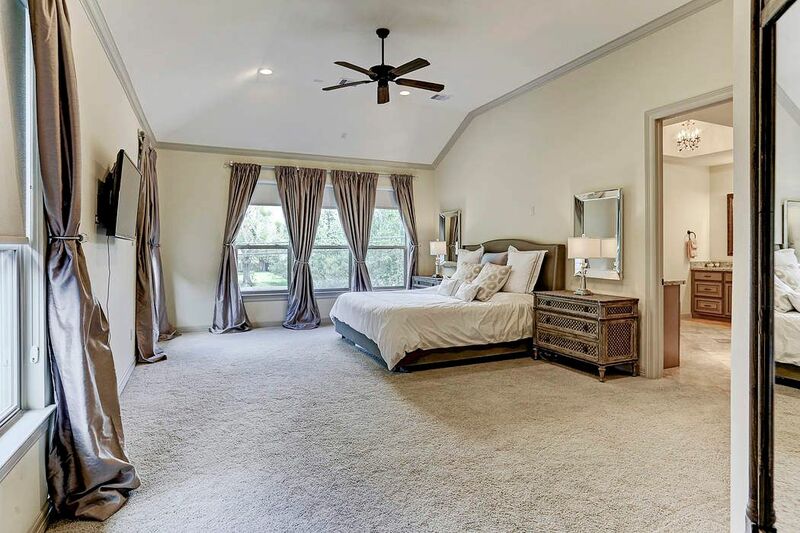 Enormous Master Suite with soaring ceiling & enough space for a sitting area. Located on the second level, features blackout shades & drapes, recessed can lighting, carpet, ceiling fan. 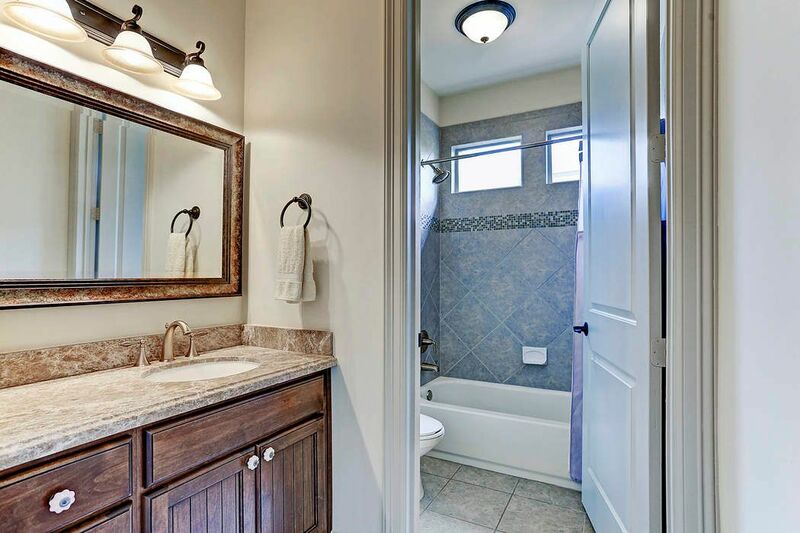 Spa-like Master Bath w/ barrel ceiling, decorative light fixture, his & her vanities w/ granite countertop, vanity knee space, over-sized jetted tub, separate shower w/ seat, water closet w/ Toto Washlet System, wired for tv on wall, linen closet. Massive master closet with "his" and "her" sections built-in shoe shelves, drawers, triple rows of hanging racks. Unbelievable amount of space! Note: home has a Nest Thermostat & security alarm system installed. 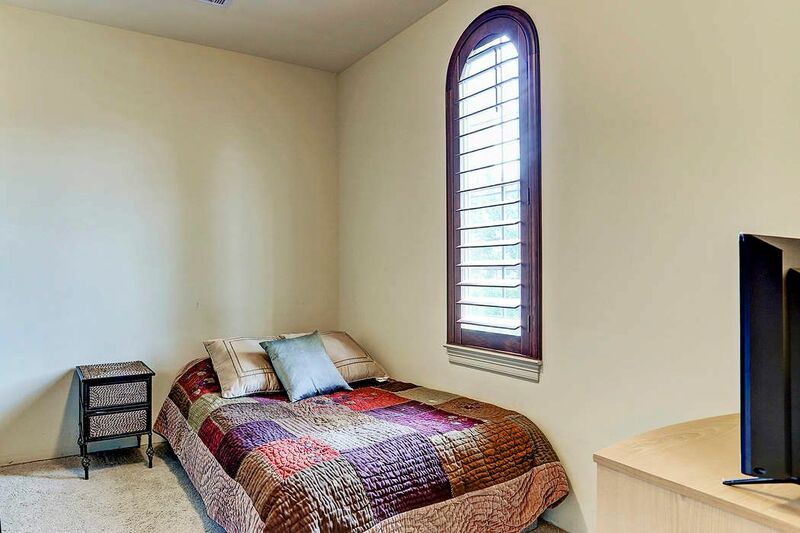 Guest Bedroom #2 features a window seat, built-in book/display shelves, custom wood plantation shutters, huge walk-in closet with built-ins, recessed can lighting, carpet. Note: wall decals can easily be removed in both guest bedrooms. En suite bath for guest bed #2 with tub/shower combination, decorative tile wall inlay, marble countertop, storage drawers and cabinets. 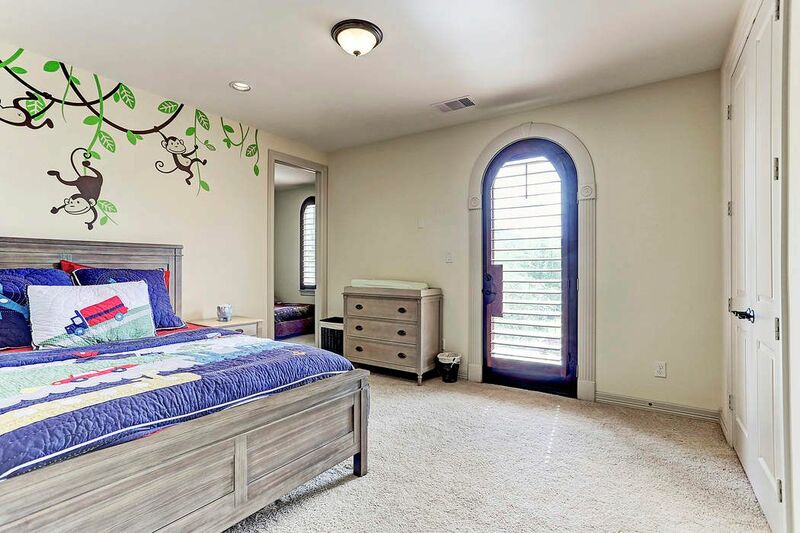 Guest Bedroom #3 features 2 sets of double door wall closets w/ built-ins, interior security camera installed,custom wood plantation shutters. To left is a bonus room. Middle door leads to balcony. Balcony has flagstone floor & decorative railing. En suite bath for guest bed #3, with tub/shower combination, decorative tile wall inlay, marble countertop, storage drawers and cabinets. Another view of loft. Door to the right leads to the Utility Room, conveniently located up w/ the bedrms. 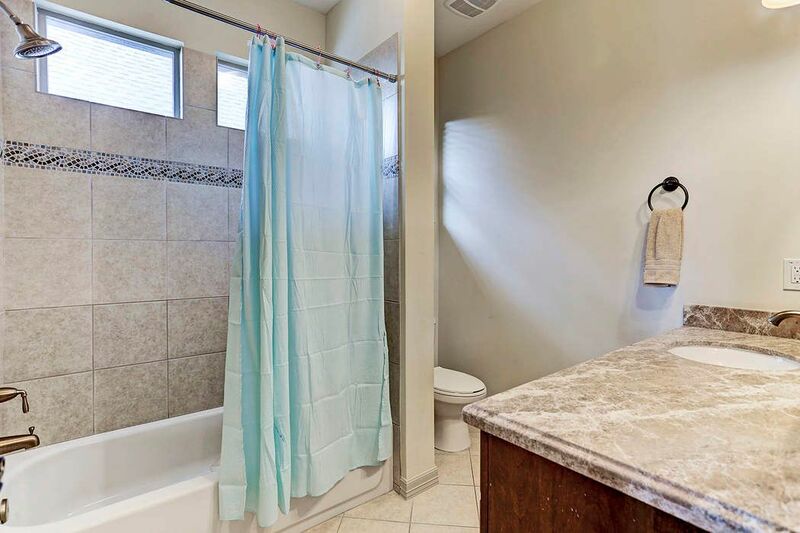 Utility room has a granite countertop, sink, dry bar, cabinets, washer/dryer connections & a very clever separate entrance to master closet! Another living room view w/ windows overlooking courtyard & showing front door entrance. Notice the Romeo balcony on 2nd floor loft space above. 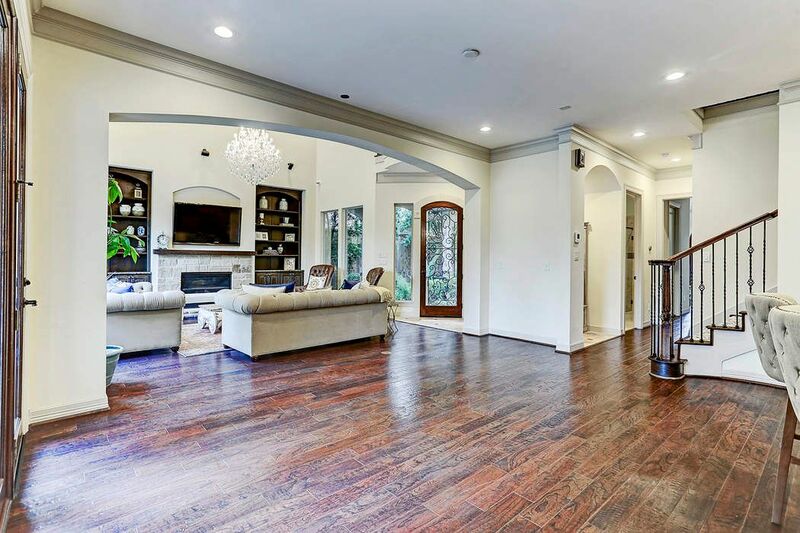 Large arched opening, recessed can lights, double crown molding, Montelena elm engineered hardwood floor. View of living room looking down from the loft area. Soaring two story high ceilings. 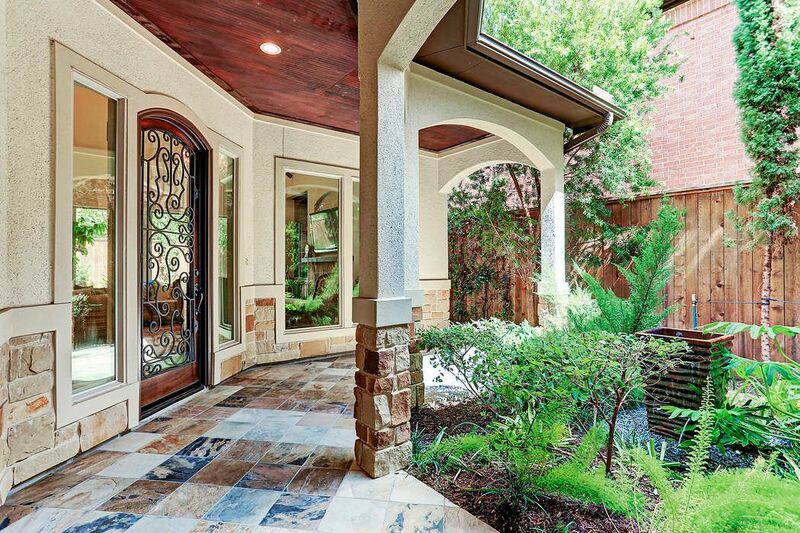 This home features stunning finishes inside and out. Truly one-of-a-kind! One more view of the summer kitchen. 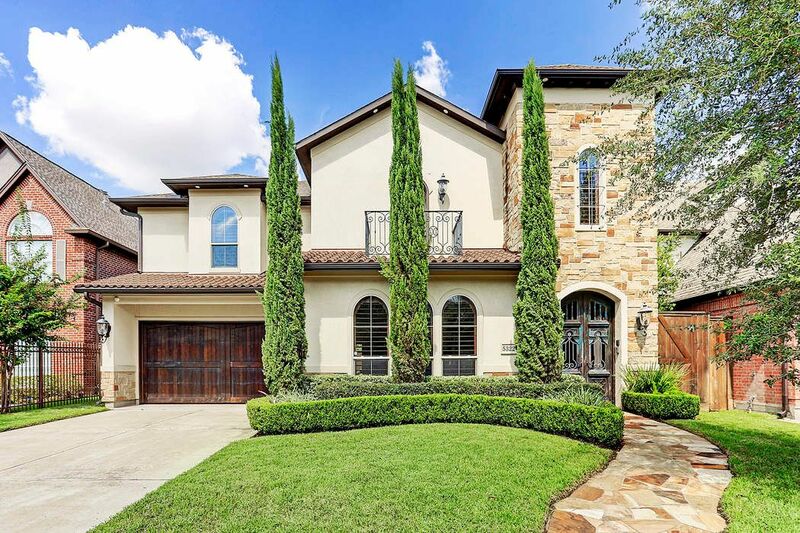 $1,125,000 4 Bedrooms4 Full Baths3,887 sq. ft.
Great new price. Priced to sell. 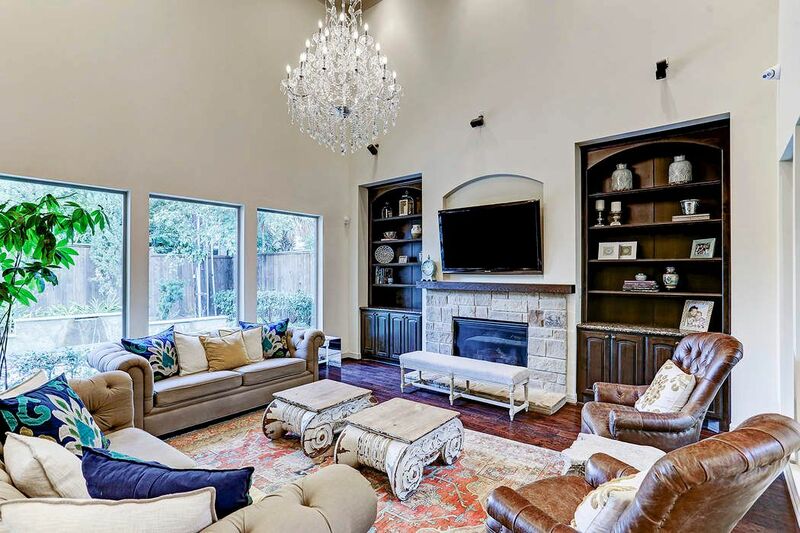 Stunning custom-designed open floor concept home in the heart of the Galleria in St George Place. Inviting courtyard entrance with fountain. 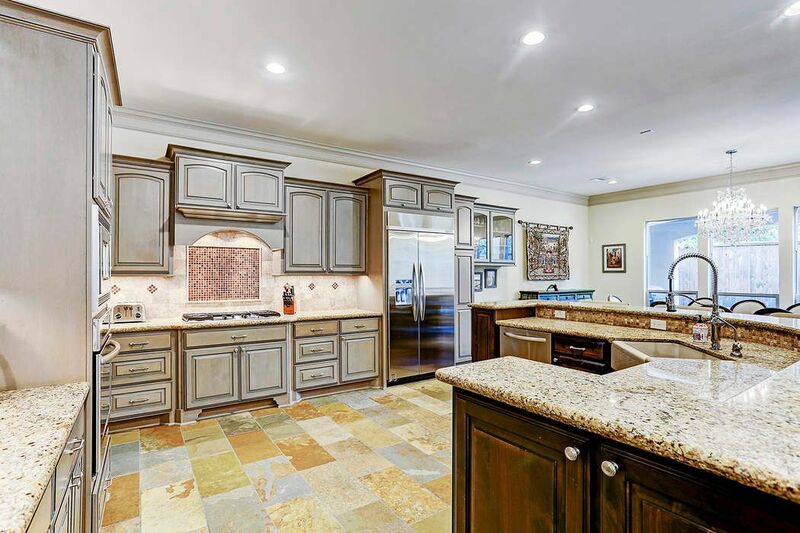 Gorgeous chef's kitchen with large breakfast bar, sunroom, dining space, impressive 2-story high ceiling in living room. 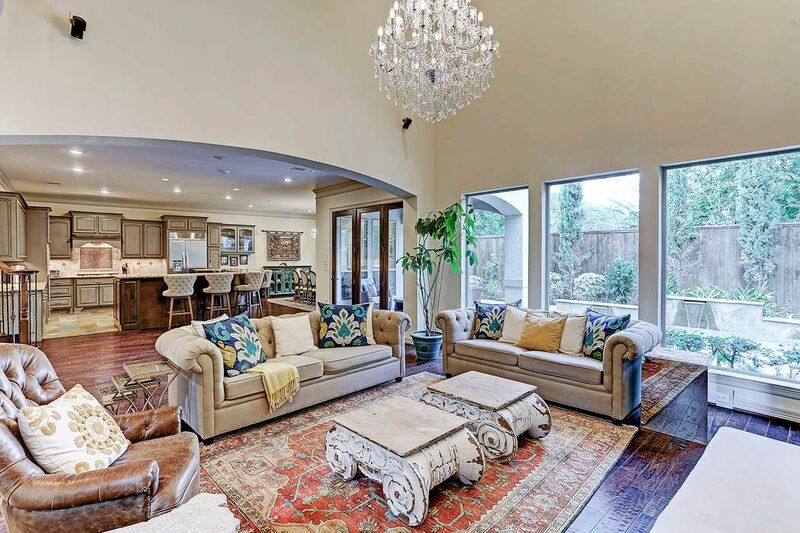 An entertainer's dream with complete open floor plan. 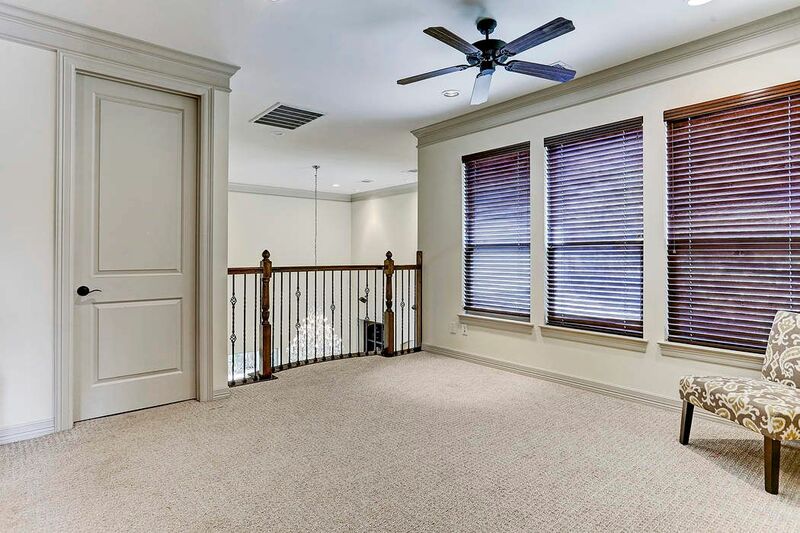 Upstairs features a spacious master suite, spa-like master bath with enormous walk-in closet, two en suite secondary bedrooms, plus a loft area and bonus room. 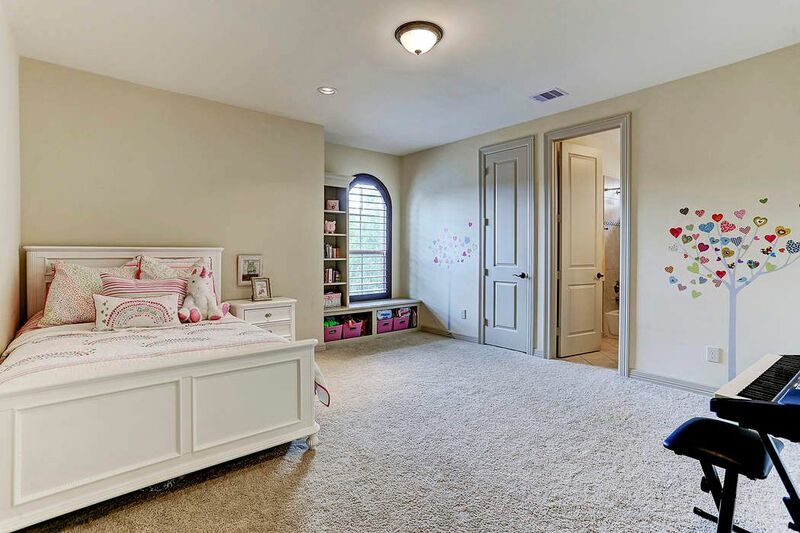 Additional guest bedroom down, makes ideal playroom or study. Various options to convert multi-use spaces. 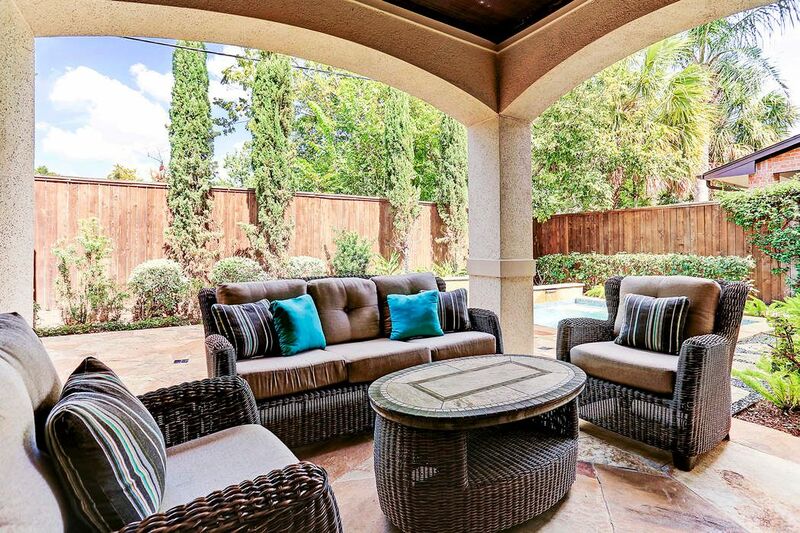 Backyard oasis with multiple covered sitting areas, summer kitchen, dip pool with waterfall, lush landscaping. Outstanding finishes throughout. Interior and exterior security cameras installed. Nest Thermostat. Upstairs utility room. Easy access to major freeways. Has never flooded. This home has it all. Freshly painted interior February 2018.